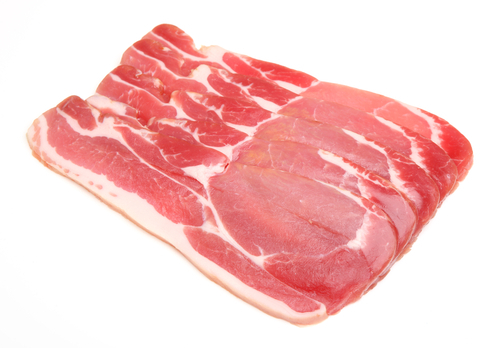 Our Unsmoked back bacon is ‘rind-on’ and a dry cure product. The pork used for our bacon is carefully selected from our farms to ensure consistency in flavour and size. The bacon does not shrink when cooked like wet cure bacon. Wet cure bacon is soaked in large vats of brine and therefore swells in size. Dry cure, on the other hand, is rubbed in a selection of salts and loses moisture which is why it will not shrink. TOP TIP: Do not cook for too long and you will have a nice soft bacon.